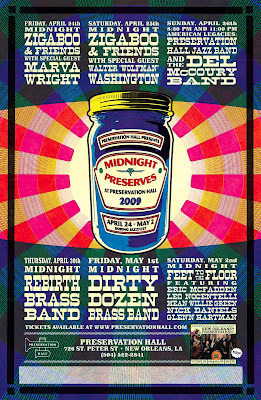 Check out this awesome line-up of midnight shows at Preservation Hall from April 29 - May 2 in New Orleans including my former teacher Glenn Hartman, members of the Meters and the Neville Brothers, The Rebirth Brass Band and the Dirty Dozen Brass Band. "Preservation Hall is proud to announce the return of Midnight Preserves, the popular late-night Jazz Fest music series hosted by the world-renowned home of Traditional New Orleans Jazz. Now in its fifth year, Midnight Preserves offers music fans the opportunity to experience intimate performances from legendary New Orleans artists as well as rare small-venue performances from some of the biggest names on the national scene. Tickets are now on sale for April 24-26 via ticketweb.com, with more dates to be added soon. Performers include Zigaboo and Friends, Marva Wright, Walter Wolfman Washington, The Del McCoury Band, The Dirty Dozen Brass Band, Leo Nocentelli, Eric McFadden and the Preservation Hall Jazz Band. Ticket sales will be limited for these intimate performances, so order in advance!" This video will make you want to go to New Orleans right now. Watch out.